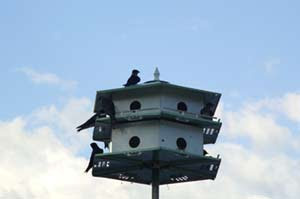 Purple Martin bird houses are essential for the survival of the Purple Martins. Purple Martins rely almost completely on man's support for housing, and once martins establish a residency, they return every year. The annual return of the Purple Martin is an exciting and much anticipated event, and martin owners need to clean out and prepare their houses in advance. Purple Martins return to their homes in the United States starting as early as mid-January for Florida residents, and continue to arrive through May in northern states. March is often considered the month martins return for the majority of the states, and they will return looking for their previous home. There is a lot of responsibility in being a Purple Martin landlord, but also a lot of reward. Purple Martins need protection from both predators and weather. If a colony is attacked due to predation, martins will typically never return to their home, and will set up residency elsewhere, but martins are more forgiving regarding fatalities due to weather. Measures can be taken to stop predation, as well as to lessen the effects of harsh weather. Predators of the Purple Martin include snakes, owls, raccoons, House Sparrows, and Starlings. Landlords often erect their Purple Martin bird houses and try to form colonies without the proper precautions because these predators are not common to the area. These predators will make themselves known very quickly once Purple Martins become active in your yard, so take the proper measures from the beginning. Purple Martin bird houses should always be placed high in the air, far from tall trees and above any trees that are nearby. Owl guards and baffles make it difficult for owls, raccoons, and snakes to get up the poles and into the compartments. Compartments should also offer numerous rooms so that martins can set up nest in the back of the house, out of reach and sight. Starling resistant holes are exceptionally useful and are much too small for Starlings and Sparrows to get in. Little can be done with regards to weather, but every effort is helpful. Purple Martins can get wiped out when there are consecutive days of heavy rainfall or extreme hot and cold temperatures. Purple Martin bird houses in northern states are often wooden, and southern states prefer aluminum houses for keeping the interior as cool as possible. Houses should always be white on the outside for this same reason as well, as white reflects the sun. Baby martins will jump from the openings to escape the heat before they know how to fly, and houses painted with white exteriors are often over 10° cooler inside. Hole openings should be dark on the contrary, to allow for martins to easily see access points and to get into the houses quickly and easily, and trim can also be dark. When the weather is very cold or rain is severe and lasting more than a couple days, Purple Martins can be fed a supplemental diet of mealworms or crickets, although not every martin will necessarily accept the meal. Martins will only eat the crickets and mealworms when the weather is inclement and they can't get their own food. Some people like to fling crickets in the air with a spoon to catch the attention of the martins and allow the martins to still catch their food mid-air. 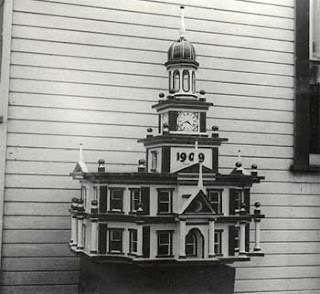 Purple Martin bird houses come in many designs, although they typically all have the same features and are easily recognizable from a distance. Purple Martins love to socialize, so houses are designed with multiple compartments, and good houses also offer porches and perches so the martins can bask in the sun and sing their pretty melodies. Purple Martins are popular for their open beak throaty songs, and they enjoy the hustle and bustle of busy human life. Purple Martin bird houses need to be open and ready when the martins return within the next few months. Make sure winter guards are removed from windows, and nests are emptied and cleaned. 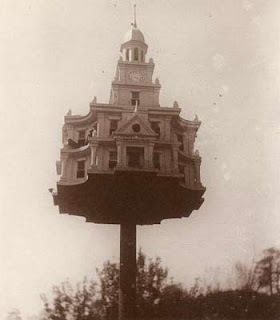 Check the houses periodically to ensure other birds are not attempting to nest, and do not relocate your martin house. 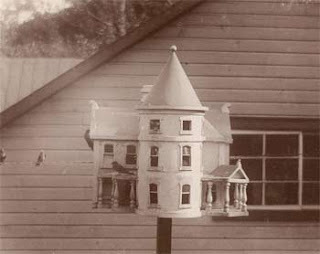 Your birds may not be able to find the new location, even if the house has only been moved a few feet. It's always fun to look at historical pictures. 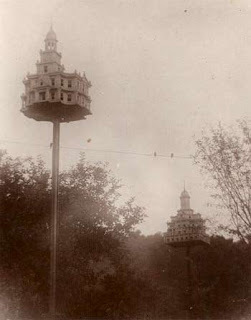 Below are pictures of the ornate Purple Martin bird houses once crafted by the noteworthy J. Warren Jacobs in the early 1900's. These houses were large and intricate, but quite difficult to maintain and clean. To help with Purple Martin research, visit the Purple Martin Conservation Association for forms to track martin arrival, document colony locations, and to view scout maps. Make the most of your Purple Martin houses by increasing your own personal knowledge of "America's Most Wanted Bird".